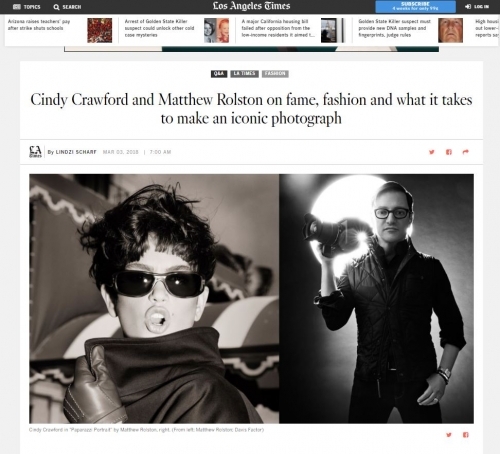 Matthew Rolston: It’s really one of those full circle moments. I’m going to be able to relive some moments from the first decade of my career and see a lot of old friends — which, of course, includes Cindy. [We’ll] celebrate that cultural moment, the rebirth of glamour that happened in the late ’70s and throughout the ’80s, which I got to be part of. Rolston: A lot. Besides, Cindy’s obvious physical gifts, strength, talent, beauty, a tremendous amount of intelligence and thoughtfulness, the ability to transcend the moment, and to communicate visually through a photograph. Her persona is something that you can’t really define, but it’s there. And you know it when you see it and, clearly, Cindy has always possessed that and she still does richly. Rolston: Although most people wouldn’t notice these details, but that wasn’t a random choice of location. That was shot in front of the awning of Chasen’s restaurant, which used to be on Beverly [Boulevard]. It was the only one left of the grand Hollywood, glamour restaurants. It’s gone now. That’s where Bristol Farms market is now. So we trekked on down so that I could have that totem of Chasen’s, that green and white awning — it was just so iconic as an emblem of celebrity and fame and Hollywood — in the picture. Another detail about that is that I’m almost 100% positive Peter Savic was the hairdresser that day. Crawford: I’m sure it was. Rolston: I don’t really come from the fashion world, to be honest. I come from the celebrity world. Even the fashion series that I did for Harper’s Bazaar [and other] magazines, always involved either an extremely famous model like Cindy, who was a personality in her own right or an actual celebrity modeling clothing. That was the beginning of the celebrity takeover of magazine covers, and I was a part of that movement. You rarely, since that time, have seen models unless they’re very, very well known models on the cover of any magazine. So I’ll comment more from the standpoint of celebrity photography, which has undergone a tremendous change. I would say that photographers of my generation or my type interpreting celebrity through our photography is possibly over. Really, it feels very outdated to me. When Kim Kardashian is in the third printing of her book at Rizzoli called [“Selfish,”] we have to recognize that that’s a significant development. Twenty-five or 30 years ago, there might have been a third printing of a book of portraits by a great photographer like Richard Avedon, but now they’re in the third printing of [“Selfish”] by Kim Kardashian. I think that the interpretation of celebrity has fallen to the celebrities themselves. They have taken it over and they control their image. They make the images of themselves. It hasn’t quite happened in fashion yet. We haven’t yet had a model do a selfie story. Although it must have happened, but it hasn’t taken over fashion. But in celebrity, to feed that machine that Cindy is talking about, which isn’t really even daily, it’s minute by minute or hourly, these people are employing some of the same photographic techniques. There is not a single picture of Kim Kardashian or most celebrities that goes out that isn’t retouched immediately before it gets tweeted out or put on Instagram. So the idealization of glamour goes on. It’s just in other people’s hands than the photographer.